Jim Bailey – misunderstood middle-distance misfit! With the upcoming Summer Olympic Games in Rio de Janeiro, the Parkes Library history blog will focus on Olympians from the Parkes Shire. Each post will provide a snapshot of the sportsmen and sportswomen who have worn the green and gold and called the Parkes Shire home at some point of their lives. 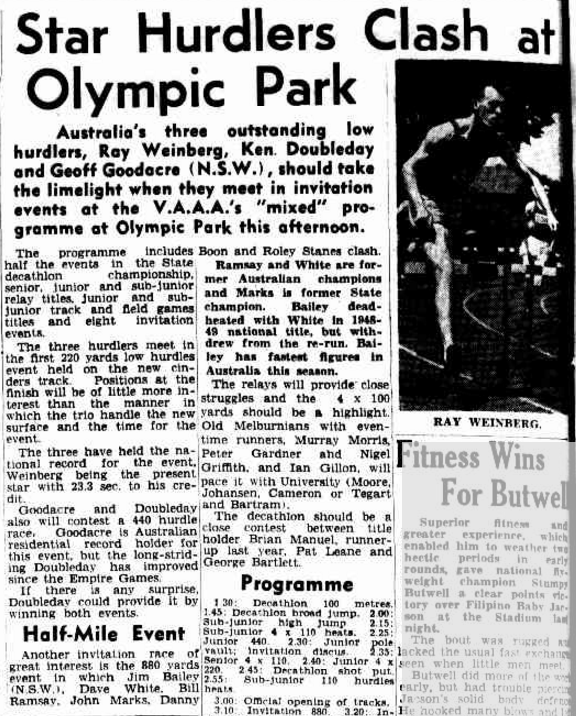 The 1950s were a golden era for sports stars from the Parkes Shire, with two representatives in athletics at the 1956 Melbourne Olympics. 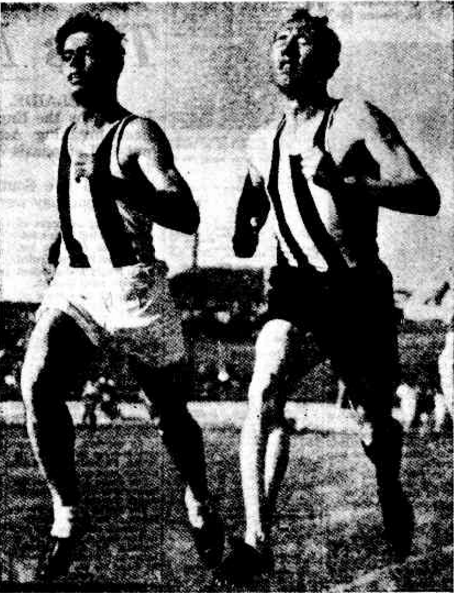 This post will be a snapshot of the second athlete who hailed from the Parkes Shire, James John “Jim” Bailey, who was a middle distance runner. Jim Bailey was the son of a health and buildings inspector with Parkes Municipal Council. Bailey was born on July 21, 1929. 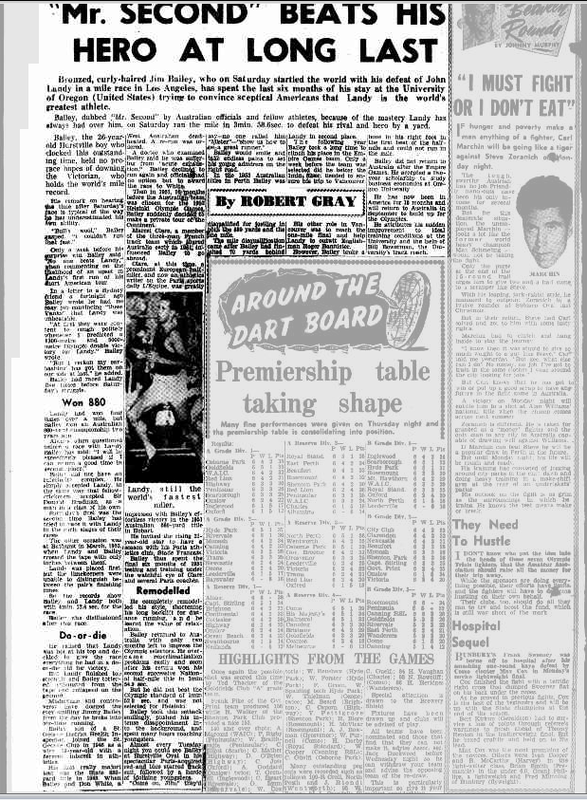 He moved to the Parkes Shire with his family when he was 18 months old and remained here for the first ten years of his life (Source: The Champion Post Monday May 8, 1956, page 1) The Bailey family moved to Hurstville and Jim joined the St George Athletics Club. 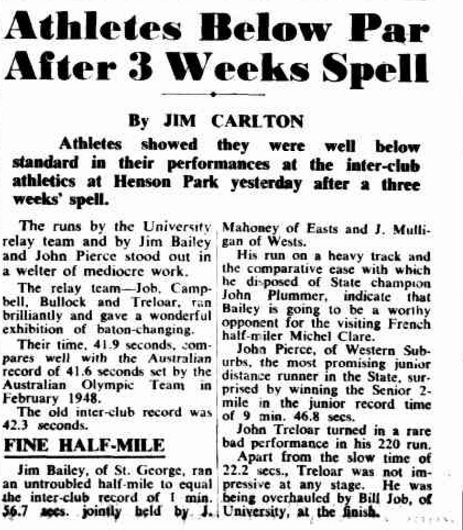 Inter-club athletics attracted more spectator and media attention in the 1950s and Jim proved to be a successful half-miler (880 yards) and mile runner (1500 metres). This was the era of other fantastic athletes in these events such as John Plummer, Dave White and Bill Ramsay. However Bailey’s biggest rival was the legendary John Landy. 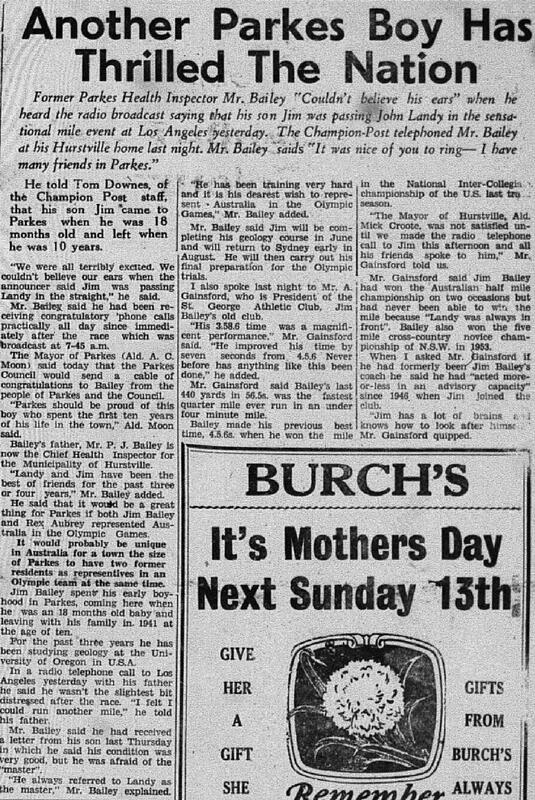 Bailey finished in a dead heat with David White in 880 yards in the 1948-49 championships. As Bailey was unable to contest the rerun, it is recorded that White finished first, Bailey second. However Bailey was to be outright winner two years later, finishing in 1:54.9 with David White runner up. At this time John Landy was also coming through the ranks, finishing second and the first in the next two years respectively. 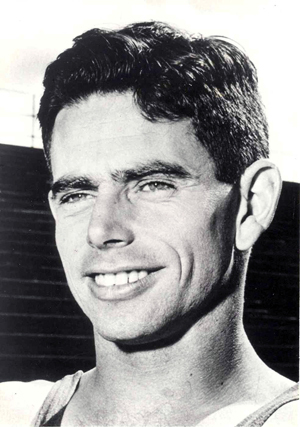 In the 1953-54 championships Bailey again won the 880 yards with a time of 1:53.2. The same championships Bailey was runner up in the mile to John Landy. Bailey’s time was 4:12.8 and Landy’s was 4:05.6. Later in 1954, Britain’s Roger Bannister would break the four minute mile. On 6 May 1954, Bannister broke the four minute barrier in front of a crowd of 3,000 spectators in Oxford, England. Bannister’s time was 3 minutes 59.4 seconds. His record stood for 46 days before it was beaten in an athletics meet in Turku, Finland. The athlete was John Landy, with a time of 3:57.9. Bailey won in 3 minutes, 58.6 seconds. He gained international fame when all he wanted was to get an invitation to the Australian Olympic trials later that year. Bailey admits now that he didn’t handle the victory well. Upon returning to Australia, he announced he was in better shape than he had been when he beat Landy, and he’d beat him by an even wider margin the next time they met. Bailey, a former pro rugby player, was cast as the roughneck from Sydney. Landy, the former record holder, was cast as the gentleman from Melbourne. Bailey admits the characterizations were closer to the truth than not. 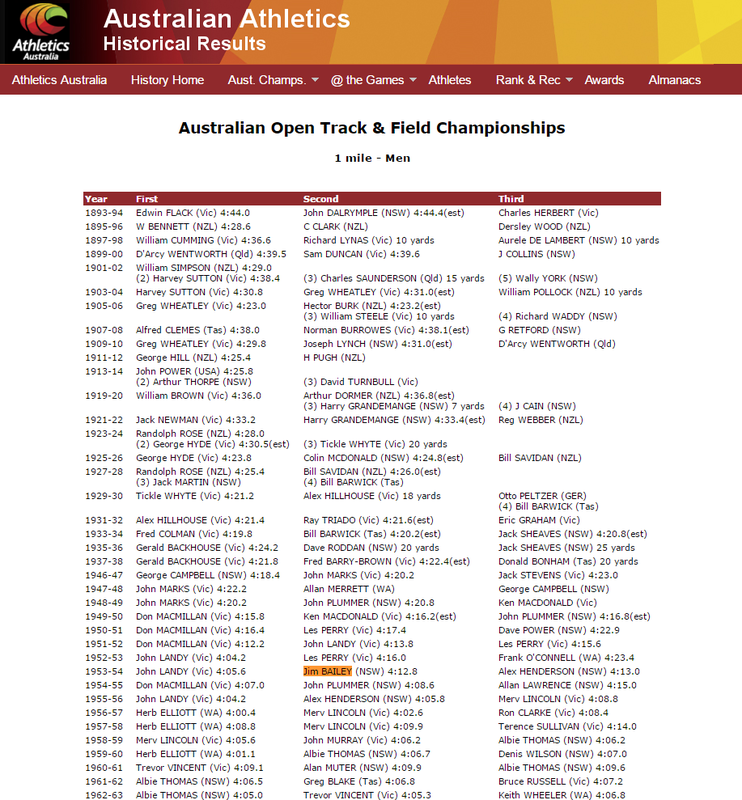 Bailey made the Australian Olympic team in both the 800 and 1,500 meters, but didn’t get out of the semifinals in the 800 and never ran the 1,500. “I wasn’t right, mentally or physically,” he said. To this day, Bailey says failing in the Olympics, in front of his countrymen, left more of an impression on his life than beating Landy and running the first sub-4 in America. “I was completely overwhelmed by what happened in Melbourne and never recovered from it,” he said. Jim Bailey returned to United States after the Olympics, working as a rep for sportswear before moving into the real estate business. Jim did competing in 1954 Empire Games in Vancouver, when Bannister defeated Landy, however he was injured in the final of the 800m event. The insult of being booed by his fellow countrymen led to below par performances in 800 metres and withdrawing from the 1,500 metres. However he leaves a positive legacy with the youngster of St George Athletics Club in the 1950s, and with University of Oregon athletics team. 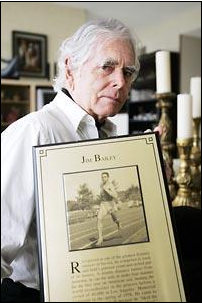 Bailey describes himself as “a misfit living on the edge.” Source: The Seattle Times Sunday April 30, 2006 Yet this doesn’t give a complete picture of the athlete and person that Jim Bailey is. He was one of a golden generation of Australian athletes. 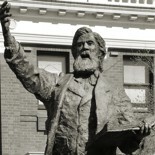 Bailey was a dedicated athlete, leaving Australia for France and later the United States of America in pursuit of bettering his technique and times with the aim of representing his country. He coached youngsters and adults, even assisting fellow runners especially in Oregon. He is also one of a small elite band of men and women who are Olympians of the Parkes Shire. If you have stories or memories that you are willing to share about Jim Bailey or any of the other Olympians of the Parkes Shire , please contact Parkes Shire Library via library@parkes.nsw.gov.au so that they can be shared and kept for posterity on this blog. Alternatively you may leave comments on this page. 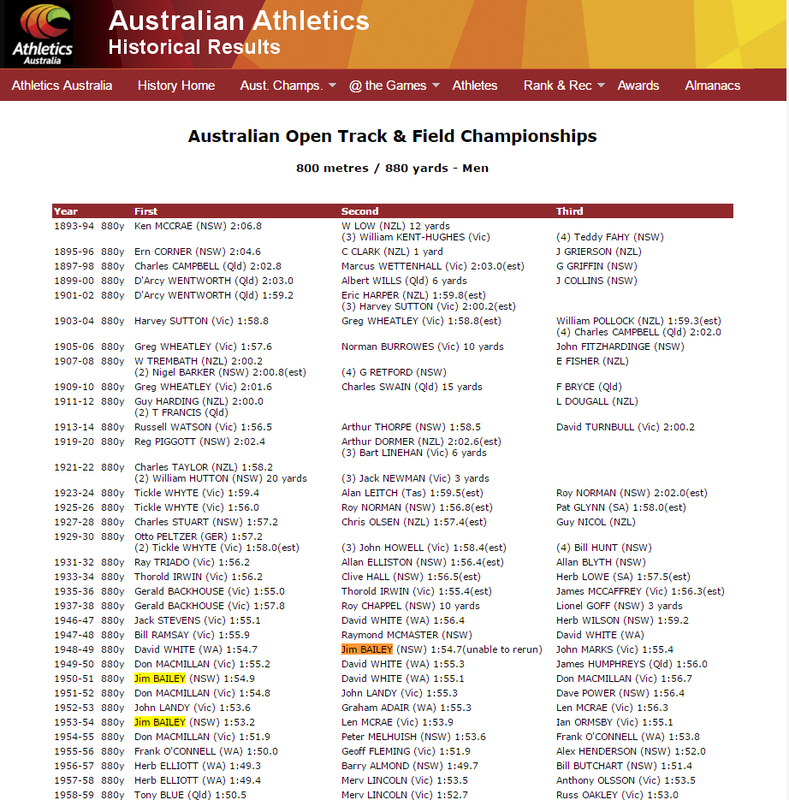 This entry was posted on July 6, 2016 by parkeslibrary in 1950s, collegiate track and field, comeback, controversy, famous people of Parkes Shire, General history, local historical articles, Olympians of the Parkes Shire, Olympic Games, Parkes, Training in France, Training in USA, Uncategorized and tagged 1 mile, 1500 metres, 1952 Helsinki Olympic Games, 1956 Olympic Games, 3 minutes 59.4 seconds, 3:57.9, 4 minute mile, 800 metres, 880 yards, Alberto Salazar, athletics, Athletics Australia, Australian champion, Bill Dellinger, Bill Ramsay, Bill Tidwell, booed, cinder track, crowd favourite, Dave White, Don MacMillan, Dyrol Burleson, Eugene, famous people of Parkes Shire, France, geology, Henson Park, Herb Elliott, history, Hurstville, inter-club athletics, international fame, Jim Bailey, Jim Grelle, John Landy, John Marks, John Plummer, L'Equipe, local reaction, Mayor Alderman A C Moon, Melbourne Olympic Games, Melbourne Olympics, Michel Clare, Mr Second, National Collegiate Athletic Association, NCAA mile champion, Olympic Park, Oregon Ducks, Oregon Sports Hall of Fame, Parkes, Parkes Champion Post, Parkes Municipal Council, Parkes Shire, public opinion, relaxation, Rio 2016, Rio de Janeiro, Roger Bannister, Ron Clarke, shock victory, St George Athletics Club, state record holder, Steve Prefontaine, sub 4 minute mile, Sugar Bowl Collegiate, The Master, The Perth Mirror, The Seattle Times, The Sunday Herald, University of Oregon, Victorian Amateur Athletics Association, villain.